For other uses, see Land's End (disambiguation). Land's End (Cornish: Penn an Wlas or Pedn an Wlas) is a headland and holiday complex in western Cornwall, England. 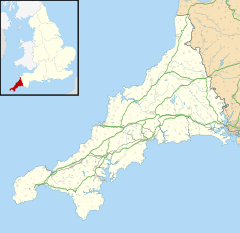 It is the most westerly point of mainland Cornwall and England, situated within the Penwith peninsula about eight miles (13 km) west-south-west of Penzance at the western end of the A30 road. The actual Land’s End or Peal Point, is a modest headland compared with nearby headlands such as Pedn-men-dhu overlooking Sennen Cove and Pordenack, to the south. The present hotel and tourist complex is at Carn Kez, 200 m south of the actual Land’s End. Land's End has a particular resonance because it is often used to suggest distance. Land's End to John o' Groats in Scotland is a distance of 838 miles (1,349 km) by road and this Land's End to John o' Groats distance is often used to define charitable events such as end-to-end walks and races in the UK. Land's End to the northernmost point of England is a distance of 556 miles (895 km) by road. Land's End is a popular venue for rock climbers. 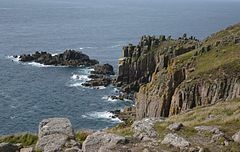 The Longships, a group of rocky islets are just over 1 mile (1.6 km) offshore, and together with the Seven Stones Reef and the Isles of Scilly which lie about 28 miles (45 km) southwest — are part of the mythical lost land of Lyonesse, referred to in Arthurian literature. The area around Land's End has been designated part of an Important Plant Area, by the organisation Plantlife, for rare species of flora. The cliffs are made of granite, an igneous rock, which means that the cliffs will be more resistant to weathering, and will have steeper cliff faces. There are two varieties of granite represented at Land's End. Adjacent to the hotel the granite is coarse-grained with large phenocrysts of orthoclase, sometimes more than 5 in (13 cm) in length. To the north, at the First and Last House, there is a finer grained granite with fewer and smaller phenocrysts, and the different granites can be seen from a distance by the smoother weathering of the finer variety. The granite dates to 268–275 million years ago of the Permian period. The contact zone between the Land's End granite pluton and the altered ″country rocks″ is nearby and the Longships Lighthouse, offshore, is built on the country rock. Of this time we are to understand what Edward I. says (Sheringham. p. 129.) that Britain, Wales, and Cornwall, were the portion of Belinus, elder son of Dunwallo, and that that part of the Island, afterwards called England, was divided in three shares, viz. Britain, which reached from the Tweed, Westward, as far as the river Ex; Wales inclosed by the rivers Severn, and Dee; and Cornwall from the river Ex to the Land's-End. Tourists have been visiting Land’s End for over three hundred years. In 1649, an early visitor was the poet John Taylor, who was hoping to find subscribers for his new book Wanderings to see the Wonders of the West. In 1878 people left Penzance by horse-drawn vehicles from outside the Queens and Union hotels and travelled via St Buryan and Treen, to see the Logan Rock. There was a short stop to look at Porthcurno and the Eastern Telegraph Company followed by refreshments at the First and Last Inn in Sennen. They then headed for Land’s End, often on foot or horse, because of the uneven and muddy lanes. Over one hundred people could be at Land's End at any one time. At Carn Kez, the First and Last Inn owned a small house which looked after the horses while visitors roamed the cliffs. The house at Carn Kez developed into the present hotel. The earliest part of the house was damaged by the Luftwaffe when a plane returning from a raid on Cardiff jettisoned its remaining bombs. 53 fisherman were injured or killed. In the build-up to D-Day American troops were billeted in the hotel leaving the building in a bad state. Land's End was owned by a Cornish family until 1982, when it was sold to David Goldstone. In 1987, Peter de Savary outbid the National Trust to purchase Land’s End for almost £7 million from David Goldstone. He had two new buildings erected and much of the present theme park development was instigated by him. He sold both Land's End and John o' Groats to businessman Graham Ferguson Lacey in 1991. The current owners purchased Land's End in 1996 and formed a company named Heritage Great Britain PLC. Attractions at the theme park include children's playgrounds and recorded music. Twice a week in August, Land's End hosts 'Magic in the Skies', a night-time firework spectacular with music by British composer Christopher Bond and narrated by actress Miriam Margolyes. Within the complex is the Land's End Hotel. In May 2012, Land's End received worldwide publicity as the starting point of the 2012 Summer Olympics torch relay. Land's End is either the start or finishing point of end to end journeys with John o'Groats in Scotland. One of the earliest was by Carlisle who left Land's End on 23 September 1879, went to John O'Groats House and arrived back at Land's End on 15 December; taking 72 days (exclusive of Sundays); covering 3,899 miles (6,275 km). To prove his journey, he kept a log book which was stamped at any Post Office he passed. An early end to end on bicycle was completed by Messrs Blackwell and Harman of Canonbury Bicycle Club. Starting at Land's End they covered 900 miles (1,400 km) in thirteen days in July/August 1880. Nearly two years later the Hon I Keith-Falconer travelled 994 miles (1,600 km). from Land's End, in twelve days, 23¼ hours, on a bicycle. On the south side of Carn Kez the land slopes away to a shallow valley containing a small stream and the former Greeb Farm. In 1879 a derrick was used for hauling seaweed from the beach 40 feet below; for use as a soil improver. Lizard Point, southernmost point of mainland England. Marshall Meadows Bay, northernmost point of England. Ness Point, easternmost point of England. "Land's End" . Encyclopædia Britannica. 16 (11th ed.). 1911. ^ "Cornwall Council adds apostrophe to Land's End". BBC News. Retrieved 12 September 2018. ^ a b Neave-Hill, Charles (1975). Land's End My Heritage. ^ Wood, Royston. "Route Guide". Lands End to John O'Groats On-line Cycling Guide. Retrieved 11 February 2016. ^ "Land's End". UKC. Retrieved 11 February 2016. ^ "Land's End". Plantlife. Retrieved 7 February 2012. ^ a b Hall, A (1994). Second (ed.). Geologist's Association Guide No. 19. West Cornwall. London:: Geologists' Association. p. 50. ISBN 0 900717 57 2. ^ "Hospitality Of The Godolphins Two Centuries Ago". The Cornishman (169). 6 October 1881. p. 7. ^ "Notes in West Cornwall". The Cornishman (10). 19 September 1878. p. 6. ^ "1987: Millionaire's big plans for English landmark". BBC. 2008. Retrieved 21 May 2011. Land's End in Cornwall has been sold for nearly £7m to the property tycoon, Peter de Savary. ^ "1987: Millionaire's big plans for English landmark". BBC. 2008. Retrieved 21 May 2011. Peter de Savary sold both Land's End and John o'Groats in 1991 for an undisclosed sum to businessman Graham Ferguson Lacey. ^ "Olympic torch: Flame arrives at Land's End". BBC News. Retrieved 26 May 2012. ^ "Carlisle Finishes His Pedestrian Tour". The Cornishman (75). 18 December 1879. p. 5. ^ "Penzance". The Cornishman (108). 5 August 1880. p. 4. ^ "A Run (Sometimes A Struggle) On A Bicycle From Land's End To John O' Groats House". The Cornishman (207 (197)). 29 June 1882. p. 6. ^ "Terrible Fall Over Cliffs Near The Land's End And Instant Death". The Cornishman (52). 10 July 1879. p. 5. Wikimedia Commons has media related to Land's End.